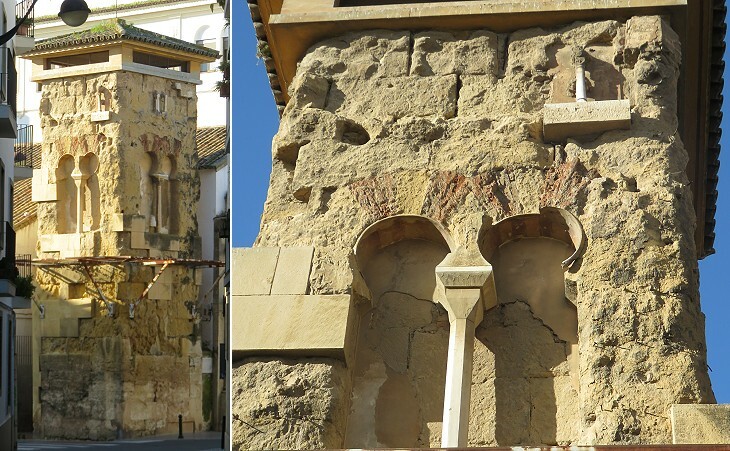 You may wish to see two introductory pages to this section or a page on Roman Cordoba first. To the Saracen Caliphs of the Ommayad family Cordova is indebted for its glory; as we hear but little of it before the year 755, when Abdoulrahman, only heir-male of the Ommayad line, passed over from Africa, at the head of a few desperate followers, and found means to raise a rebellion in Spain. After a battle fought on the banks of the Guadalquiver, in which he overthrew the lieutenant of the Abbasid Caliph, Abdoulrahman became king of all the Moorish possessions in the South of Spain, and in 759 fixed his royal residence at Cordova. 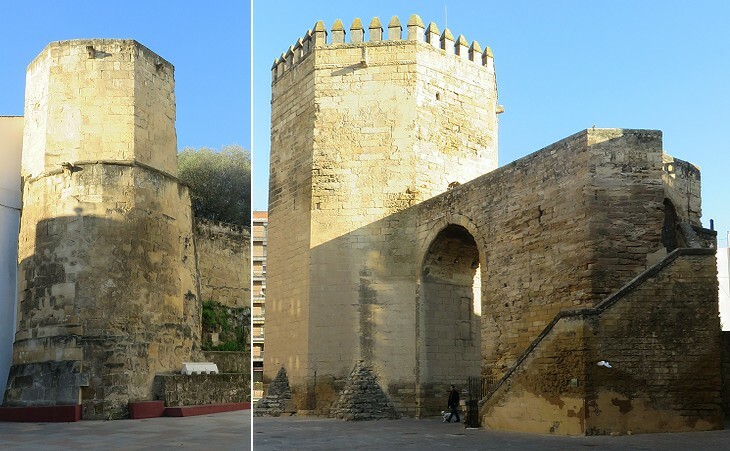 Puerta de Almodovar is one of three remaining medieval gates of Cordoba. It was redesigned in the XIVth century. The original gate most likely had a horseshoe arch. The walk round the lonely walls is picturesque. 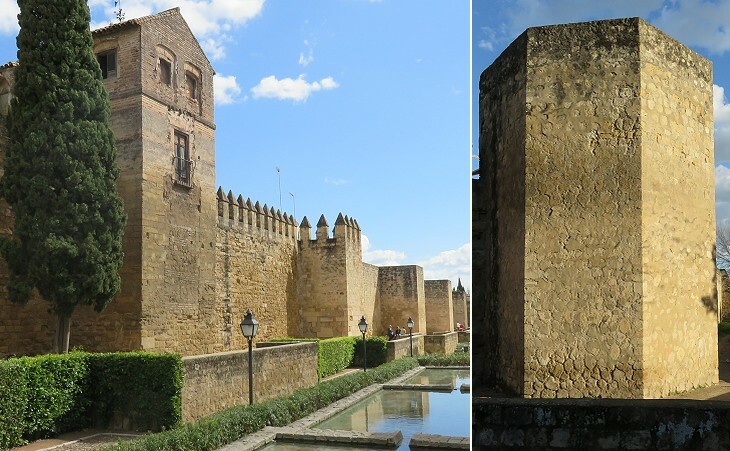 They are Moorish, and built of "tapia"; with their gates and towers they must have been nearly similar to that original circumvallation described by Caesar (De Bello Civili). Estimates of the population of Cordoba at its apogee in the Xth century greatly vary. The figure of one million inhabitants which is deduced from Arab chronicles of the number of its mosques and bathhouses is often quoted. A more reasonable assessment is in the region of 150,000-450,000. Considering the size of the medina, the walled town, the lower figure seems more realistic. 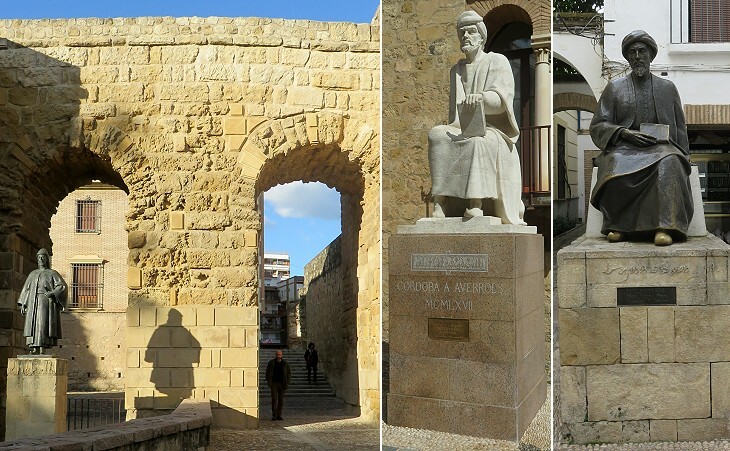 Even this figure made Cordoba the most populated city of Europe together with Constantinople. 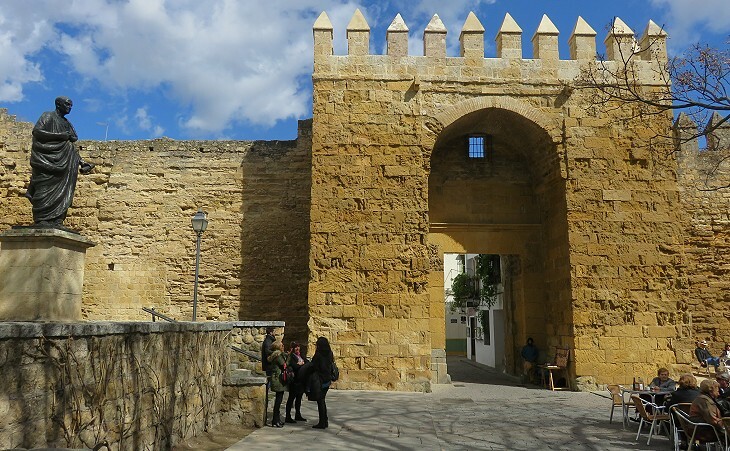 The Muslim rulers of Cordoba built additional walls to protect Axarquia, a new neighbourhood in the eastern part of the town; the name comes from the Arabic sharqi meaning eastern. Puerta del Rincon was one of the passages between the medina and Axarquia. This tower was built at the beginning of the XVth century on the site of a Moorish one. It is named Malmuerta (wrongly killed) because according to legend it was built as a vow by a knight who had killed his wife on the wrong assumption she had committed adultery. Four hundred pounds of virgin gold. Lingots of silver to the value of 420,000 sequins. Four hundred pounds of lignum aloes, one piece weighing one hundred and forty pounds. Five hundred ounces of ambergrease. Three hundred ounces of camphore. Thirty pieces of gold tissue, so rich that none but the Caliph could wear it. Ten suits of Khorassan sables. One hundred suits of Fur of a less valuable sort. Forty-eight sets of gold and silk long trappings for horses. Four thousand pounds of silk. Eight hundred iron coats of mail for war horses. 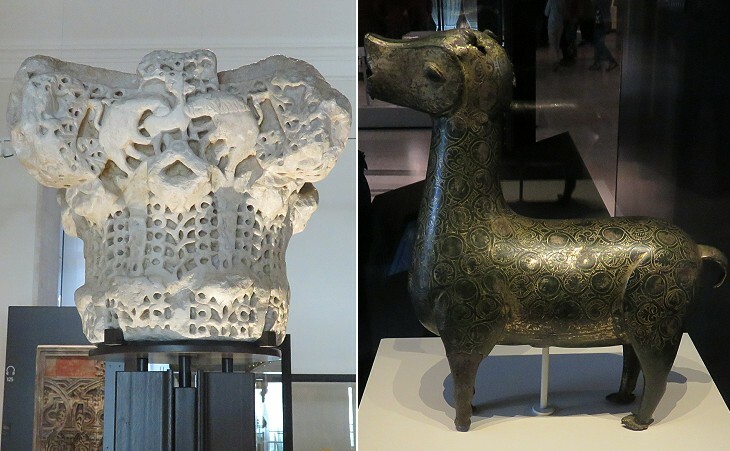 Fifteen led horses of Arabia, as richly caparisoned as those the Caliph was wont to ride. One hundred horses of an inferior price. Twenty mules with all their accoutrements. Forty young men, and twenty girls of exquisite beauty, and most sumptuously decked out. This display of riches was accompanied with a most flattering poem, composed by the minister in praise of his sovereign, who, in return for this homage, assigned him a pension of an hundred thousand pieces of gold. Caliphal Cordoba was a very cosmopolitan city and its rulers, while strictly complying with the prohibition of portraying living beings in mosques, saw nothing wrong in the depiction of animals for purely decorative purposes in other buildings. The Caliphs of Cordoba were usually in good terms with the Emperors of Constantinople. They shared the same enemies i.e. the Fatimid Caliphs of Ifriqiya (Tunisia) and the Abbasid Caliphs of Baghdad. The Great Mosque was decorated with the assistance of Byzantine mosaic makers. 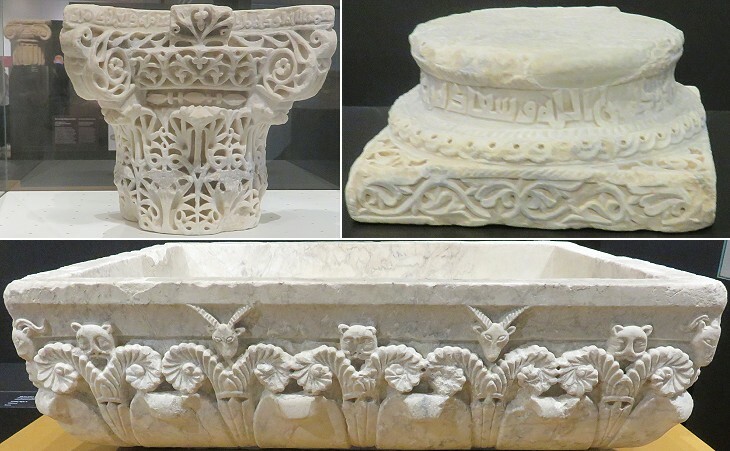 It is likely that also some skilled sculptors from Constantinople were employed in the decoration of marble architectural elements (see a capital at Hagia Sophia in Constantinople). 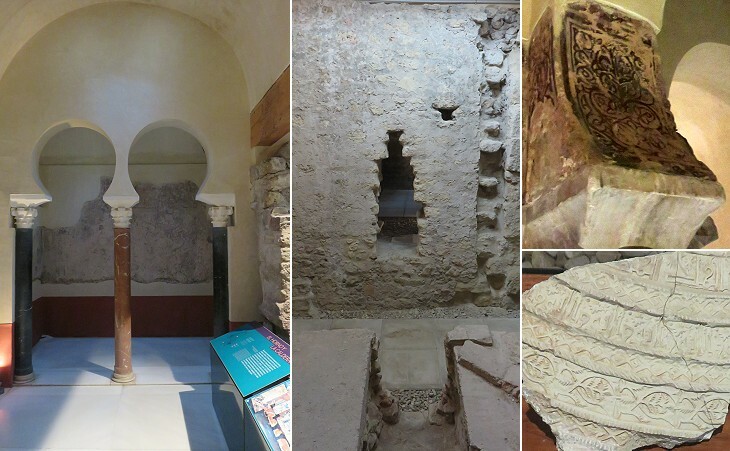 The baths were built in the Xth century for the enjoyment of the caliph and his court. 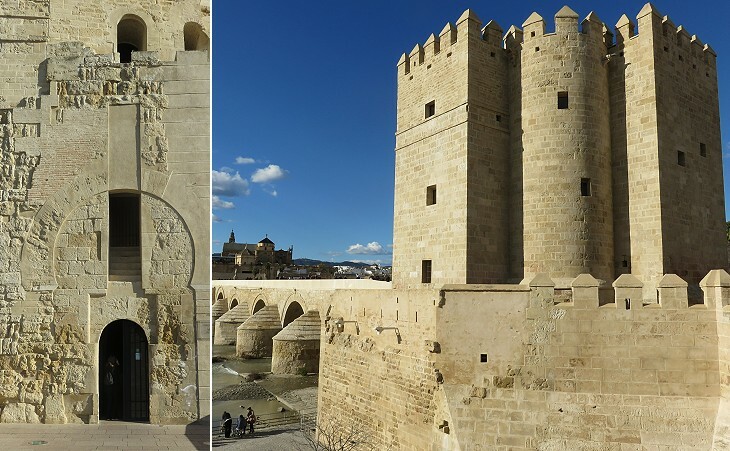 Between the XIth and XIIIth centuries, they were used by the Almoravid and Almohad Moroccan sultans who managed to submit the small taifa (emirates) into which the Caliphate of Cordoba was split in ca 1031. The remains of the baths were found accidentally in 1903 and were subsequently buried. 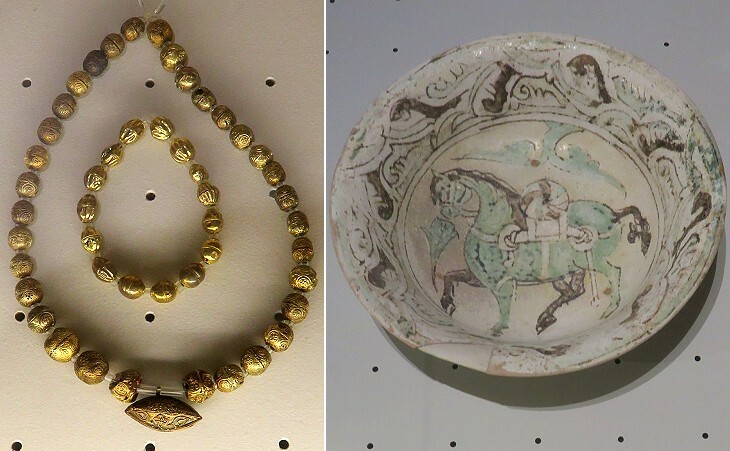 They were recovered in the 1960s and eventually restored. In 1212 the Almohads suffered a crushing defeat by a Christian coalition in the Battle of Las Navas de Tolosa. The event had long lasting consequences: King Ferdinand III of Castile conquered Cordoba in 1236 and Seville in 1248 with the help of the first Nasrid ruler of Granada. Move to Roman Cordoba or The Great Mosque or Cordoba after 1236.